"All is set for the 2nd Annual Lansing DAZE Criterium. This is a Women ONLY event being held in Lansing, Kansas. Prizes galore, a new and personalized trophy for the Women's Masters Group Winners both Open and Category 4 in all age groups, personalized medals for second and third places, large cash payouts for Juniors, and Category 3/4 women, primes from the Susan Komen foundation(some of the primes are wrapped in a Longaberger basket donated by my special friend Rosalee Robinson), police protected closed course, city street sweeper swept course on day of race, and FREE massages, KCKCC Message Therapy Students, donated by Farmer's Group Insurance, and Tailwind Cycling. NEW Riders ONLY, bring the discount card provided by our friends at Boulevard, see what kind of a discount that you receive for your entry fee. 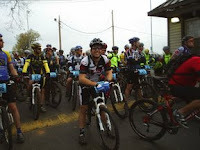 New added field, Masters Women Open 30+, preregistration via fax, 913.682.5247, scan to this address jpg please, or drop off at Santa Fe Trails Bicycle and Coffee Shop. Will we ever get to race??? It rained solid here from 9:30 to 1:00 am. We've checked the trails this morning and will have to cancel the race due to conditions. Stay tuned for updates. The KCMO Citywide Trails Plan project team is challenging the creative minds of Kansas City (no age or expertise requirements) to a trails logo and naming competition. The winning logo and name may appear on trail signage, trail promotional materials, and mile markers and serve as the new "brand" for Kansas City's trail system. Please forward the entry form and informational flyer to your friends, family, colleagues, students, and neighbors. For more information please visit http://www.kcmotrails.com. 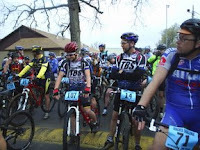 Look for a full race report and pictures here. 5th Annual VeloTek Grand Prix. The 5th Annual VeloTek Grand Prix is just around the corning. 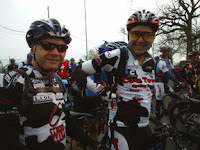 Coach Jim Whittaker and his GP VeloTek team put on this annual time based stage race. A 2.5 km TT and Criterium are will be held on Saturday April 26th out at Clinton Lake. 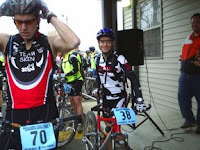 Sunday April 27th brings the Lake Perry Road Race. 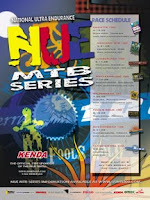 Time bonuses for top placings are available - see event flyer. Here is the flyer for the 08' Velotek Grand Prix. We need your support for a safe bike/pedestrian crossing on the Paseo Bridge by having your presence at the ground breaking Friday, April 18 at 2 pm. Ride your bike, walk, run or take transit to the ceremony. MoDOT and Senator Kit Bond will be there. 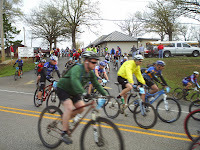 Friday, April 18, 2:00 p.m.
* Bike there: A group of cyclists will ride 1.5 miles from the KCATA park-and-ride lot at 3rd and Grand, leaving promptly at 1:40 p.m.
* Bus there: The Isle of Capri is served by Metro bus #173 - Casino Cruiser. It leaves the 10th & Main Transit Center at 1:41 p.m. and arrives at the casino at 1:50 p.m. The return bus leaves at 3:08 p.m. Route map and schedule (PDF). * Walk there: The Isle of Capri is walkable from Berkley Riverfront Park, via the Riverfront Heritage Trail. Work is being done to design and get funding for the Paseo bridgebike/ped ramps that MODOT said has to happen to get them to completethe bike/ped lane on the bridge. There are 2 separate KCMO council resolutions asking for it and a regional River Crossing Policy that recommends it. KCMO is committed to it and MODOT needs to see that they must stand behind their agreement to finish the bike/ped lane on the bridge deck if other agencies can get the connecting ramps there. 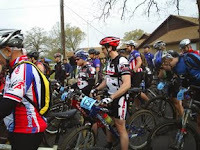 Do to the current and projected weather conditions at Crowder State Park, the Crank-N-Cruise Mountain Bike Race that was scheduled for Sunday, April 13th has been POSTPONED…More details forthcoming. I'm sure you were probably expecting this message. I know you are frustrated, as are we. We choose to look at the "Big Picture" and the impact our decisions will make in the long run, not for immediate gratification. 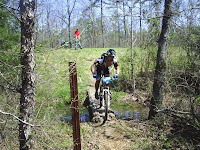 Racing in the mud is not fun and is detrimental to the ecology of the trail systems we utilize for our race venues. 'm not willing to compromise our trails or cobble together an alternative "short option" that would simply satisfy the requirements of "calling it a race." We have some of the best trails in north Missouri. That is why we host a race. 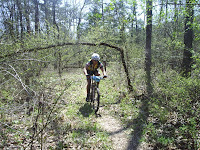 We want to showcase our wonderful trails. We would rather wait until the conditions improve and we can offer a better racing experience. We, Heartland Sport Promotions [HSP], have very high standards and expectations for our events. 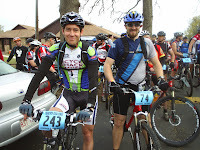 We strive for the best and that is what racers have come to expect when they participate in our events. The decision to cancel or reschedule a race is not totally ours to make. We are utilizing public lands and have a land manager that has jurisdiction in making the final decision as to whether an event will proceed or be cancelled. At Crowder State Park that decision is based on environmental impact, public safety, and following the established policies concerning inclement weather and trail closures. 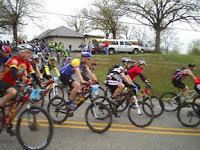 Please continue to monitor the Heartland web page for updated information on the 2008 race schedule. We are looking at possible options for rescheduling events. I hope you will continue to support our efforts to provide the racing community with quality events. 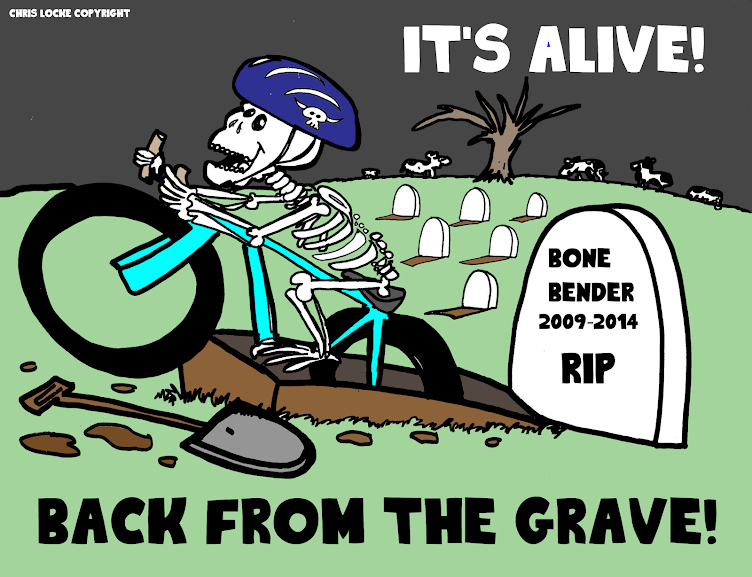 We love to ride bikes and share trails just like you do! 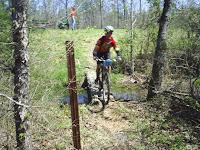 The 7th Annual Quachita Challenge was held this past weekend in Oden, AR. 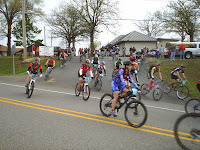 The Ouachita Cycling Club put on a great event with a ride on Saturday and then the race on Sunday. Both events sell out quickly so be sure to put this event on your "must do" list. Still waiting on the official results, but here is what I do know. 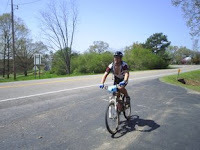 Jeff Winkler (former National Collegiate Road Champion) won the overall title in 4 hrs 29 min. 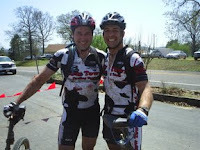 For Cow Town Rich Anderson had a great race to finish in around 25th (~5hrs 20 min). Chris Locke finished in 35th (~5hrs 30min). 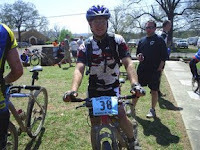 Randy Cartwright had some mechanical troubles but still finished in 51st. Mike Classed ended up coming in a little under 6 hours, 30 min.